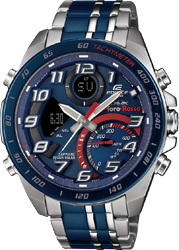 This is the latest collaboration model between EDIFICE and SCUDERIA TORO ROSSO Formula 1 team. This new model features a trio of design points that gives the wearer a feel of the SCUDERIA TORO ROSSO team world. 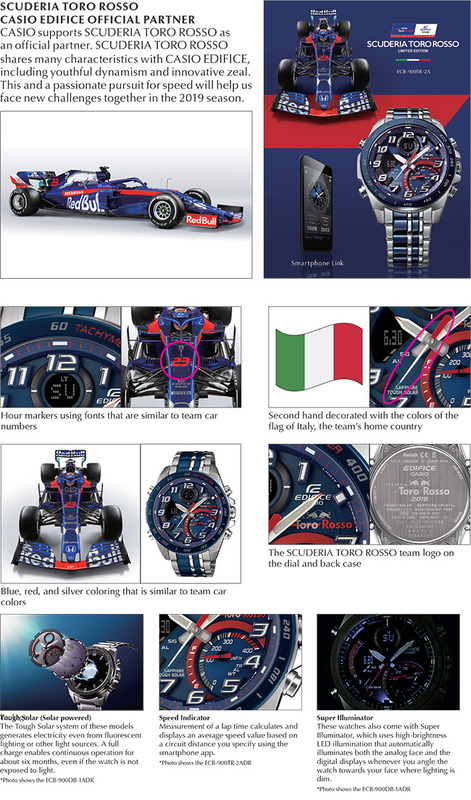 team's home country The exciting design of this model is completed by the SCUDERIA TORO ROSSO team logo on the dial and back case. Functions are the same as the high-performance ECB-900 base model. 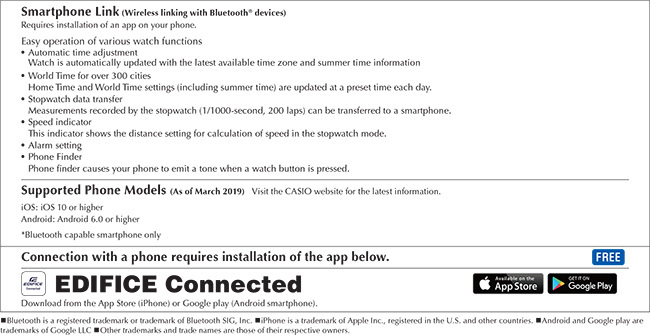 Establishing a Bluetooth connection between the watch and a smartphone ensures accurate timekeeping, and a phone can also be used to configure a variety of watch settings. Digital displays at 12 o'clock and 9 o'clock team up with the analog indications to show information in an easy-to-understand format. A high-brightness Full Auto LED light automatically illuminates both the analog face and the digital displays whenever you angle the watch towards your face where lighting is dim. A motorsports inspired 1/1000-second stopwatch shows the average speed when a lap time is recorded. The sporty blue, red, and silver design and motorsports specs of this model makes it the perfect choice for SCUDERIA TORO ROSSO fans.